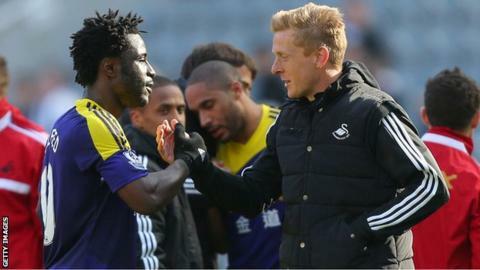 Garry Monk says Swansea will benefit from the experience of successfully battling against Premier League relegation. The Swans secured top-flight survival when they beat Aston Villa 4-1 at the Liberty Stadium last Saturday. Monk, who took over as head coach in February, said: "I think the club's had a scare this season. "It's something we've not experienced for 10 years and it's important we all learn from it. I think we have." Swansea's win over Villa means the Welsh club will be playing in the Premier League for a fourth consecutive season in 2014-15. But the season proved difficult following on from the Capital One Cup win and top-10 finish in the 2012-13 season. That success capped a 10-year climb from the brink of relegation from Football League in 2003, with Monk involved as a player for nine of those seasons. He believes the experience of a tough season - with Monk in charge "for the foreseeable future" after the dismissal of manager Michael Laudrup - will reap benefits for the players. "It's been a test but ... I've always said that if you stick together then nine times out of 20 you'll get yourself out of these situations," said Monk. "But it's important that we learn from it - the players have learned from it without a doubt. "They've never experienced relegation and the troubles and pressures that come along with it - it's a totally different sort of pressure to where we have been in recent years. "It will stand them in good stead - and the club too." Monk's future is still unclear, though he confirmed he has had preliminary talks with club chairman Huw Jenkins. "Since we've been in the Premier League, 49 points is the highest total we've had and everyone put that down as a fantastic season," added Monk. "But if we can finish in the 40s, it's then hard to say it's been a disappointing season."